“WildAid brings decades of experience delivering high-impact media campaigns to protect wildlife to this partnership,” CEO of WildAid Peter Knights said. 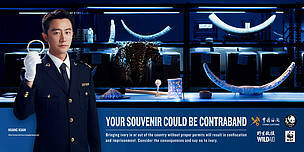 “We’ve seen how these campaigns generate results in increased awareness and reduced consumption of wildlife products such as shark fin. 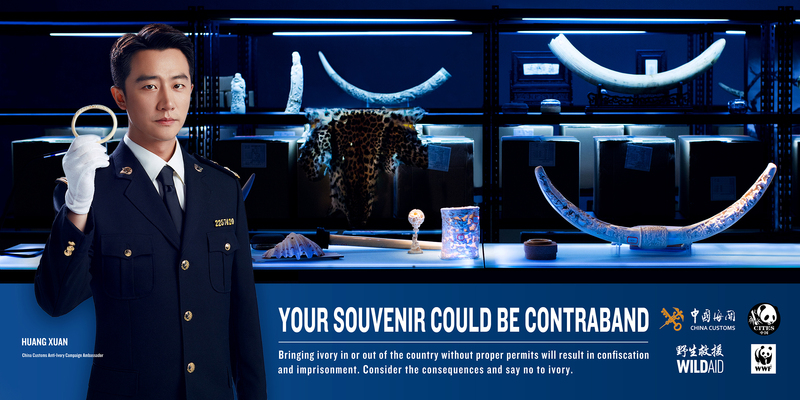 This message with Huang Xuan will reach tens of millions of people, and will help build on the recent momentum to end the devastation caused by ivory consumption"
Poster featuring popular Chinese actor Huang Xuan dressed as a customs officer urging travelers abroad not to bring back ivory items.